I have been wanting to make strawberry basil jam for a while, ever since I was gifted a jar at a holiday social over at Alice Lane Home. My basil is growing like crazy now, so I thought I would use some of it up before the first frost hits and it all dies. The combination of strawberries and basil is really a mouth pleaser. Such a unique taste, and perfect on your morning toast, or over some goat cheese with crackers! The recipe is simple, basically off the box of pectin, but you just add some minced basil! BRING water canner, half full with water, to simmer. Wash jars and screw bands in hot soapy water; rinse with warm water. Pour boiling water over flat lids in saucepan off the heat. Let stand in hot water until ready to use. Drain well before filling. STEM and crush strawberries thoroughly, one layer at a time with a potato masher (you want to keep it chunky, do not puree!). Measure exactly 5-3/4 cups prepared mashed strawberries into 6- or 8-qt. saucepot. Stir in lemon juice, and minced basil. STIR pectin into prepared fruit in saucepot. Add butter to reduce foaming. Bring mixture to full rolling boil (a boil that doesn’t stop bubbling when stirred) on high heat, stirring constantly. Stir in sugar. Return to full rolling boil and boil exactly 4 min., stirring constantly. Remove from heat. Skim off any foam with metal spoon. LADLE immediately into prepared jars, filling to within 1/8 inch of tops. Wipe jar rims and threads. Cover with 2-piece lids. Screw bands tightly. Place jars on elevated rack in canner. Lower rack into canner. (Water must cover jars by 1 to 2 inches. Add boiling water, if necessary.) Cover; bring water to gentle boil. Process 10 min*. Remove jars and place upright on towel to cool completely. After jars cool, check seals by pressing middle of lid with finger. (If lid springs back, lid is not sealed and refrigeration is necessary.) Let cool, and sit at room temperature for 24 hours. Store unopened jars in a cool dry place for up to a year. Do not try to reduce the amount of sugar for this recipe. 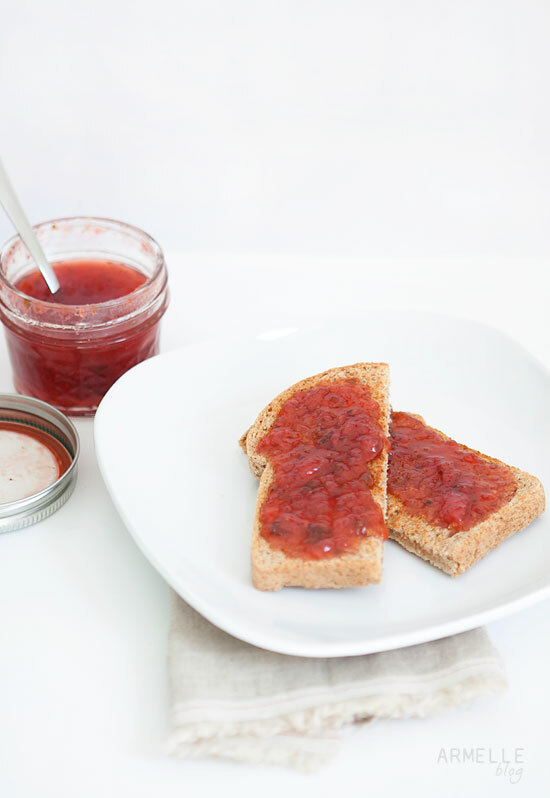 You have to have the exact amounts of each ingredient, or the jam will not set up.